or simply use an electronic tuner which offers precise pitch measuring. You can tune the remaining strings relatively to a previously tuned string. For example, if you fret the tuned G string on the 5th fret you'll get a C note which corresponds to the open string below; the open C string is supposed to be an octave lower than the fretted C note on the G string, so keep that in mind to prevent the string from breaking. After the C string is tuned, you can fret it on the 4th fret and you'll get an E – the note needed on the next string. After the open E string is in tune, fret it on the 5th fret to achieve an A, which is the note the last open string needs to match. Simply turn the pegs on the ukulele's head to coincide the notes as you tune the instrument. Grace” and “London Bridge is Falling Down”. 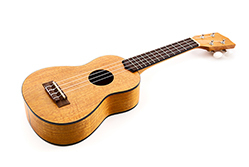 Wooden instruments are susceptible to environmental conditions which means that humidity and temperature may determine the condition of your ukulele. While getting a climate-controlled room isn't practical at all, keeping a close eye on your instruments is the best way to prevent damage. When not in use, remember to store the ukulele in a case to protect it from falling and dust. As with any other string instrument, the sound of it depends greatly on the strings' condition and overall cleanness. The nylon strings on the ukulele resist to the oil and grease released by the fingertips much better than steel-stringed instruments. You should change the strings when you notice grooves, flat spots or nicks on their length, as these signs can tell you they're fragile and easily breakable. If you notice your ukulele losing its tune or tone, it may be telling you that the strings are too old and thus losing their qualities. To clean your ukulele you should remove the strings, making string replacements excellent excuses for basic care. Cleaning and polishing your ukulele will help protect it. When it comes to the fretboard, you should use a fine cloth or a 0000 fine steel wool to remove the grime. Use a plastic scrubber to remove the dirt that accumulates next to the frets. To finish your fretboard care, use some mineral or brand fretboard oil to polish it and restore its smoothness.